Rock Memorabilia and Collectibles Auctions - Backstage Auctions, Inc. 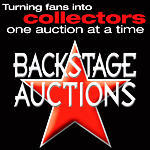 Backstage Auctions is a boutique online auction house specializing in authentic rock and roll music memorabilia. By exclusively representing legendary musicians and entertainment professionals directly, every auction event is unique, reflects the seller's legacy and chronicles their legendary career. Backstage Auctions has represented an impressive list of notable and very talented musicians, producers and managers in the music industry. While other auction sites may give you that front row feel, Backstage Auctions goes one step further. By exclusively representing musicians, bands, managers, producers, record label executives and promoters, every online auction event features rare, one of a kind rock and roll treasures direct from their personal collections. Whether you collect posters, vinyl, stage gear or apparel, recordings, awards, photos, promotional items or even vintage concert t-shirts we've got you covered! Our auctions offer a truly unique, historical and unforgettable experience spanning decades of music history and delivered directly to fans and collectors around the world. In House Shipping Service with full insurance, tracking and professional shipping & packaging - we do it all for you! If you are a musician or industry professional and would like to learn more about our auction services, we invite you to check out our consignment page for more information. Register today for your VIP All Access Pass and start experiencing the difference!